There’s an image which has been circulated on Facebook which compares two articles about violent crimes in London. One refers to a ‘thug’ named Kersan Euell who kicked a female police officer into the path of a bus and, along with an accomplice (Martin Payne), was jailed for a total of six years on the 21st of January. Another refers to the ongoing trial of one of the men involved in the murder of Jaden Moodie, a 14-year-old boy who was knocked off a moped in east London and then stabbed to death; a young man named Ayoub Majdouline has been charged with the murder and remanded in custody. The newspaper headline calls the first defendant a ‘thug’ and the second just a ‘teen’. The lines drawn on the clip imply that the word ‘thug’ was used of Kersan Euell because he was black and the more neutral ‘teen’ used of Ayoub Majdouline because he was not. There are, in fact, other reasons why these terms would have been used. In this country newspapers have to avoid prejudicing ongoing trials: the fact that Ayoub Majdouline has only been charged, not convicted, of the crime means that the matter is said to be sub judice and press have to be very careful of what they say or they could end up in court themselves. These laws no longer exist in the United States as they were struck down on First Amendment grounds, but they are very much still alive in the UK. This is why they cannot call him a thug; that word implies a propensity for violence. The two men who kicked the police officer have been convicted of a violent offence; that means that reporting restrictions are lifted, assuming there is no other trial that could be prejudiced and the people convicted are adults, not minors (if they are, the judge may or may not allow the press to name them, depending on the seriousness of the crime, their age and whether it he believes it is in the public interest). In the USA the term ‘thug’ has come to be understood as a racial slur, associated with negative stereotypes of Black people being aggressive or violent; it’s also associated with gangsta rap and the culture surrounding it, and the rapper Tupac Shakur called his group Thug Life. Notoriously, a white man who killed a Black teenager in a car at a filling station in Florida in 2012 because he disliked the music they were playing had told his girlfriend, “I hate that thug music”. In this country, there are no such racial connotations. It means a habitually or professionally violent person and is used, in the media and elsewhere, of such people of any race, including white racists, football hooligans and sometimes police officers. When I was growing up, the phrase “teenage thugs” appeared in the media on a regular basis as it railed against the out-of-control youth. This guy wasn’t called a thug because of his clothing or his taste for rap music. He kicked a woman in the street, putting her life in danger because it was a busy main road, because he was annoyed that he and his friend had been pulled over for driving a car without insurance which, as is well-known, is illegal. That is a fairly good example of thuggish behaviour. 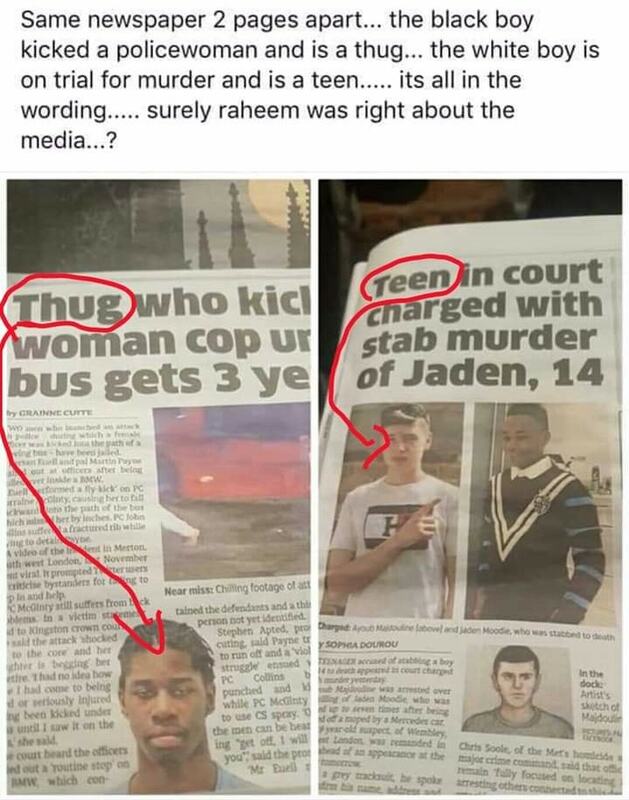 The originator, who is in the UK, clearly saw the word ‘thug’ linked to a Black man and assumed it was racially biased, but it really is not, and there are good reasons why the other man (who, incidentally, is charged with killing a Black teenage boy) was not called that.